Instead of growing veggies in a patch of straight rows of crops, kids can plant a variety of interesting perennial edibles in a relaxed design in the landscape. To grow perennial veggies, kids can check plant labels at the nursery to discover their winter hardiness, as it is important to get the right variety for the climate. Kids can plant their veggies in raised beds that can be filled with rich organic soil and compost and allow kids to reach inside to care for their plants without stepping on the soil. 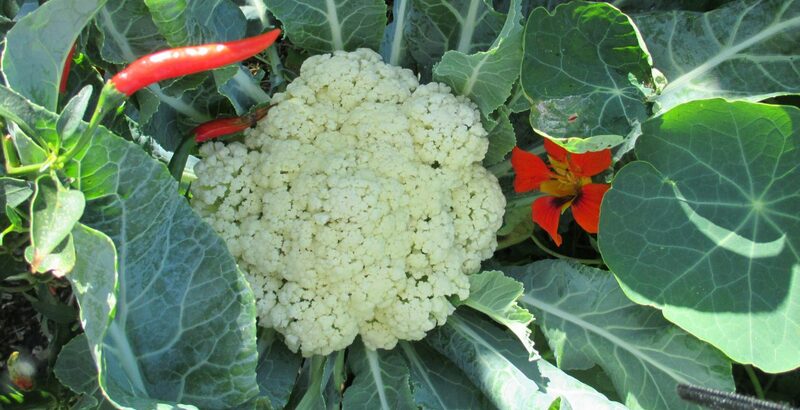 The most popular perennial veggies are artichoke, asparagus, and rhubarb, all cold season crops. Artichokes are perennial veggies in California and other warm climates, where they grow 3 to 5 feet tall and look lovely in the landscape. 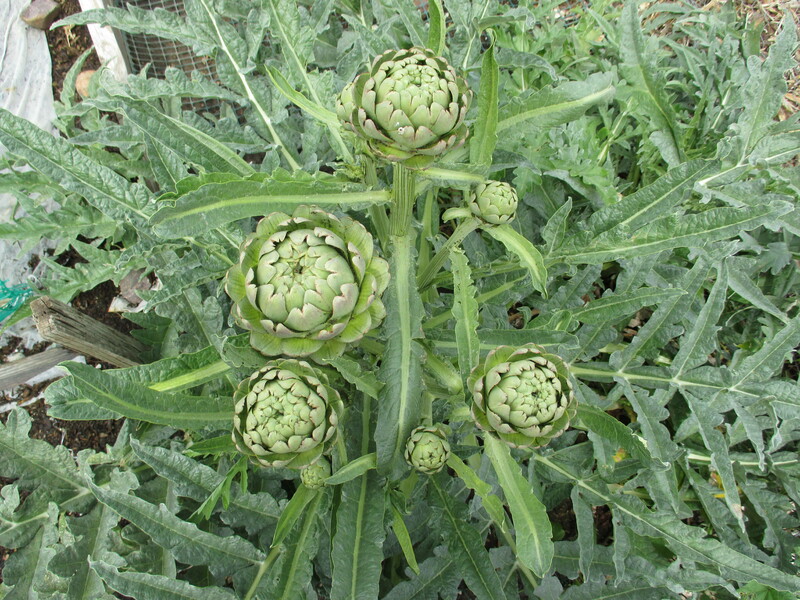 Artichokes can be propagated by seed or by slicing a 10” sucker from the parent plant with a section of the root in rich composted soil. Their roots go down 4 feet and they grow well with asparagus, cabbage, beets, and lettuce. In the fall, prune the plants to the ground. When the artichoke head is still closed and about the size of an orange, kids can cut the stem a couple of inches below the head. If the head is not harvested, the bud will blossom into a beautiful purple-blue flower. Asparagus is hardy in cold climates, especially when kids protect the crowns with 6 inches of mulch during the winter. Asparagus needs to grow two to three years before bearing edible spears. When the spears are 6 to 8 inches high, kids can harvest them by cutting ½ inch below the soil surface to prevent disease. Asparagus roots are shallow, extending outward 5 to 6 feet, making them good companions for all deep rooted veggies. Kids can start seeds by soaking them overnight before planting or plant dormant roots by spreading the roots, covering the crowns with compost, and watering well. Rhubarb is a hardy perennial, dying down to the ground in winter and regrowing in spring to 3 feet tall and 6 feet wide. When daytime temperatures average above 75°, the plants will go dormant and sprout again in autumn when the temperatures get cooler. Kids can plant dormant roots by digging a hole 2 feet wide and 1 foot deep. Kids can harvest the outer stalks, a few at a time and leave the rest to grow. Rhubarb has very attractive, large, tropical-looking foliage and bright red stalks. They look gorgeous in the landscape with other perennial veggies, flowers, and herbs. Chocolate and tahini make a healthy, rich, and delectable fudge filled with energy. Tahini is sesame seed butter that is heart healthy, easy to digest, and fights inflammation. The cocoa bean has flavonoids that help regenerate cell growth and guard the body against diseases, keeping blood vessels healthy and decreasing inflammation. Kids can make this yummy fudge with toasted organic pecans and shredded organic coconut. Preheat the oven to 350°. The deep fragrant flavors and essential oils of nuts are released when they are toasted. In a medium bowl place 2 tbsp organic cocoa powder, ½ cup organic tahini, ¼ cup honey, ¼ cup maple syrup, ¾ cup organic powdered coconut milk, and ¾ cup fine shredded organic coconut and mix well. Put ¼ cup organic pecans on a baking sheet and toast in the oven for 8 – 10 minutes. Chop the pecans and stir into the fudge. Kids can use a teaspoon to scoop up the fudge and roll it gently into 1 inch balls in the palm of their hands. 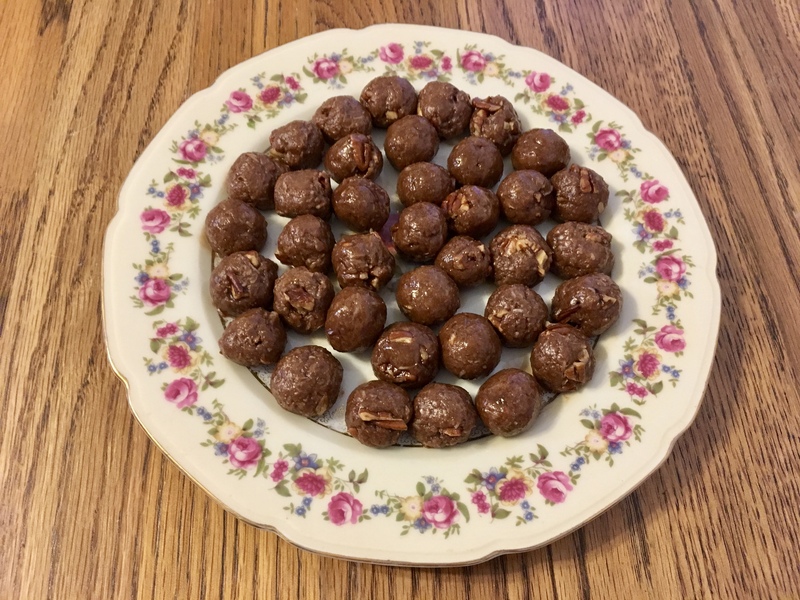 Kids can also roll the balls in their favorite toppings such as, ground organic pistachios, toasted organic sesame seeds, organic shredded coconut, and organic cocoa powder. Refrigerate an hour. Tahini is used in many middle eastern dishes, such as hummus and baba ganouj, as well as in salad dressings and desserts. It is a seed butter that kids can make from 2 cups ground hulled and roasted organic white sesame seeds and ¼ cup organic extra virgin olive oil. Tahini is heart healthy, easy to digest, fights inflammation, and is rich in omega-3 fatty acids, calcium, protein, and fiber. Salad dressing: In a small bowl, mix 1/4 cup olive oil, 1/4 cup tahini, 3 tbsp lemon juice, 2 tsp Dijon mustard, 1 minced garlic clove, 2 tsp maple syrup, 1/2 tsp salt, and 2 tbsp water. Hummus (a chickpea dip): In the blender, pour a strained and rinsed can of organic chickpeas, 4 tablespoons extra virgin olive oil, ½ tsp cumin, 2 tbsp tahini, 1 chopped garlic clove, 4 tablespoons fresh squeezed lemon, ½ teaspoon curry powder, and ¾ teaspoon sea salt and mix until smooth and creamy. 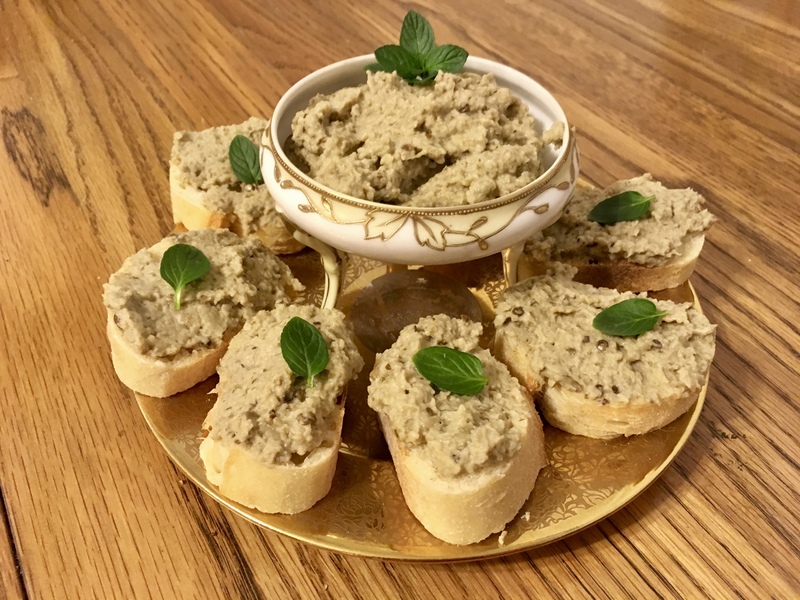 Baba Ganouj (an eggplant dip): Preheat oven to 400°. Bake 1 large organic eggplant on a baking sheet covered with parchment paper for 30 -35 minutes. In a medium bowl, mince 1 organic garlic clove with ½ tsp sea salt and work it into a paste. Stir into the garlic, the peeled, chopped, and baked eggplant with 1 tbsp organic extra virgin olive oil, 1 tsp fresh lemon juice, 4 tsp organic tahini, ⅛ tsp cumin, and ⅛ tsp cayenne. Pour the mixture into the blender and mix until smooth. Tahini is also delicious as halva, a confection made with boiled sugar, that has been popular in the Middle East for thousands of years. Halva is a favorite kids snack. Tahini halva may be sweet, but it packs a lot of energy and nutrition, being rich in protein, calcium, vitamin E, and phosphate. 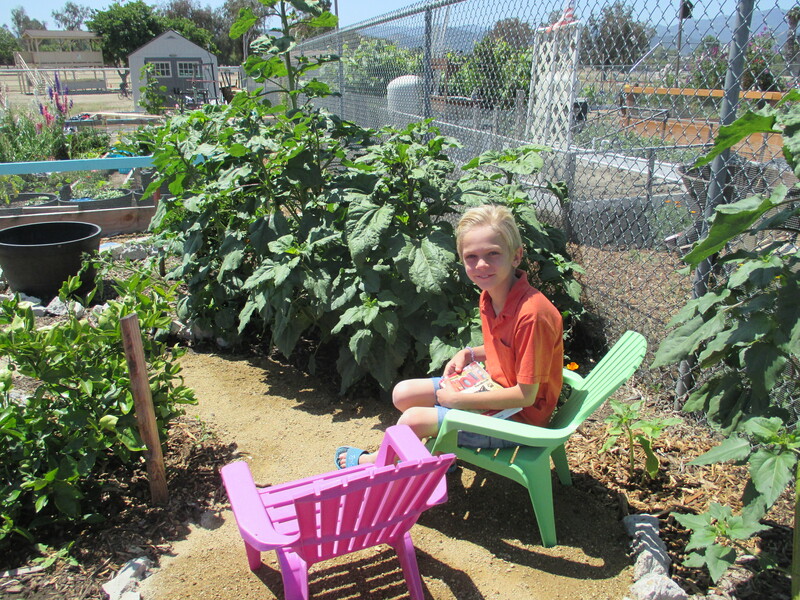 Kids can discover a safe and happy place in their organic food garden by creating a comfortable place to sit and experience the wonders of nature, write in a journal, or draw a picture, away from addictive electronics. In their happy place, kids can observe the sun, wind, and rain patterns in the oxygen rich environment in their garden. Kids can make a place for wildlife in their garden sanctuary and hang a bird feeder, set up a bird bath, create a pond, and plant shrubs and wildflowers that provide food and nectar for birds and insects. Kids can learn their connection to the intricate web of life and get excited watching their fruits and veggies grow. All plants are living beings, capable of learning from experience. When a plant is submitted to drought or too much salt, it will respond by modifying its anatomy and metabolism to ensure its survival. When the same thing happens again, the plant responds biochemically, even quicker and more effectively. Plants also produce nectars to attract and repel insects. Kids can watch plants move in time-lapse films where the action is speeded up and watch the flow of water through the cell membranes creating the motion. The root system is the most important part of the plant, with tiny roots constantly advancing and gathering information about which direction to grow. More than 90% of plants have a collaborative relationship with mycorrhiza, a fungus that grows on plant roots. The mycorrhizal system has extremely fine filaments, which gives it a much greater surface area than the plants own roots for absorbing water and nutrients from the surrounding soil, giving energy to the fungus and the plant, while enriching the soil. Soil microbes called mycobacterium vaccae are found in healthy soil that make kids feel happy and relaxed when they are gardening. These antidepressant microbes in the soil have been found to improve cognitive functions, lower stress, and lift moods. Kids find that singing and dancing in their Spring Garden inspires the plants to grow big and strong. Kids can happily observe the natural happenings in their garden and contemplate the amazing life of plants. Kids can eat a rainbow of veggies in this versatile casserole, where every different colored veggie offers a different set of phytonutrients, vitamins, and minerals. Kids can choose their favorite veggies or use whatever they harvest that day from their organic raised bed garden to create their casserole. Kid Chefs can chop and steam their chosen veggies, for example: 1 cup of butternut squash, 1 organic white sweet potato, and 1 cup of broccoli rabe. To add depth of flavor to every casserole, also steam ¼ cup organic chopped red pepper, ¼ cup organic chopped onion, 1 minced garlic clove, and 1 minced seeded chili pepper. Steam 18 minutes. Preheat the oven to 350°. Cook 1 ½ cups of organic farfalle pasta or any fun shaped organic artisan or whole grain pasta. In a saucepan melt 1 tbsp organic extra virgin coconut oil and stir in 1 tbsp organic whole wheat pastry flour and cook for 2 minutes. Add ½ cup of organic almond milk, ½ cup organic coconut yogurt,½ tsp salt and ½ tsp curry powder. 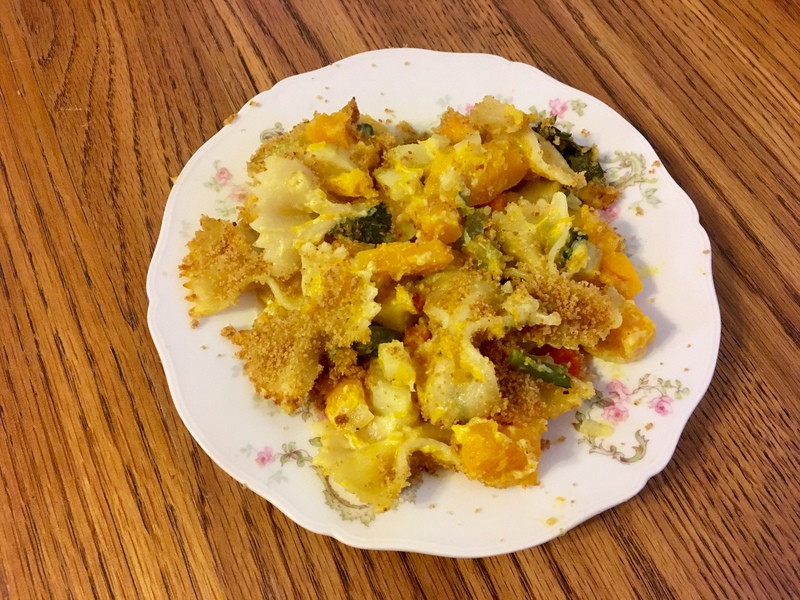 In a casserole dish, mix the veggies, pasta, and creamy sauce. In a small pan, heat 1 tbsp organic extra virgin olive oil and ¼ cup organic whole wheat bread crumbs with dash of salt and cumin. Distribute the bread crumbs on top of the casserole. Toast ¼ cup of organic walnuts in the oven for 8 minutes. Kids can let cool, chop, and sprinkle them over the top of the casserole. Kids can bake the casserole for 30 minutes. 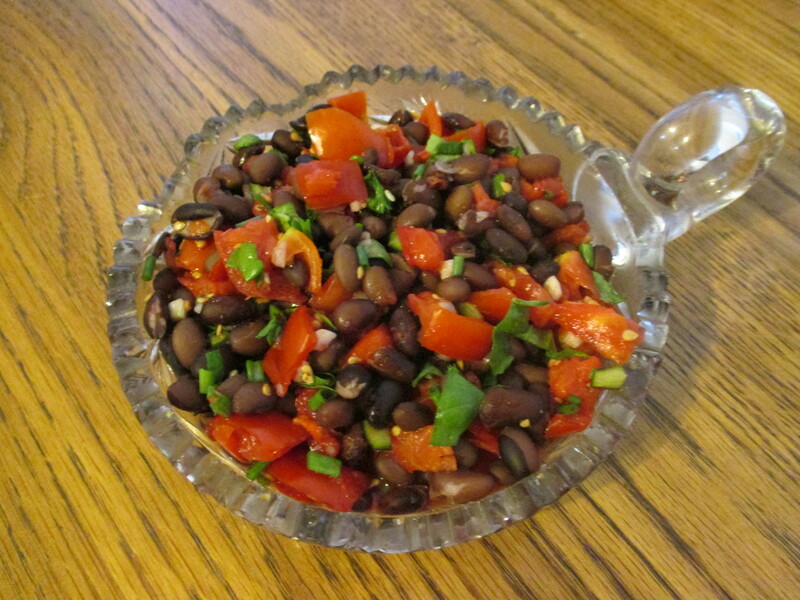 This casserole serves 4 and can be stored in the refrigerator for up to a week. Kids that eat a high fiber diet are less likely to be overweight, have diabetes, stomach cancer, or heart disease. Fiber is a group of carbohydrates that comes from plants which are not broken down and used by the human digestive tract. Fiber fills the stomach and helps push food through the digestive system. There are different kinds of fiber: moisture holding fiber, insoluble fiber, gas producing fiber, and fiber less likely to be gassy. Some types of insoluble fiber are easily fermented by the bacteria in the colon, making them more likely to provoke gas, like beans, cabbage, and peas. Foods with more soluble fiber, like cooked grains, beets, and carrots, are softer and pass through the stomach and digestive system quickly. For a healthy diet, kids can eat different types of fiber rich foods, chewed throughly and eaten in relatively small portions. Kids can grow an abundant organic regenerative raised bed garden without chemical fertilizers, herbicides, or pesticides and help turn around the the crisis in the world’s soil health, fresh water availability, air quality, and human health. Living organic soil is the womb of nature and feeding it pure water, lots of compost, and red wriggler worms gets the best results. After World War II chemical factories began to produce nitrogen fertilizers, which is the main reason for the increased concentration of nitrous oxide in the atmosphere. These chemicals are now a threat to human health, marine life, wildlife, and the world’s environment. At the same time, chemical factories created toxic pesticide compounds, which came into widespread and ever increasing use and has caused considerable damage to wildlife, insects, birds, and the entire food chain. Every year billons of tons of topsoil is eroded by wind and water, especially where there is deforestation and the damaging and degrading effect of conventional farming practices. Kids can add more compost and mulch to their garden to enrich the soil. More organic matter, like compost, in the soil will hold more water, making growing plants more resilient to drought. Kids can plant cover crops in their raised beds for a season to revitalize the soil with natural nitrates. 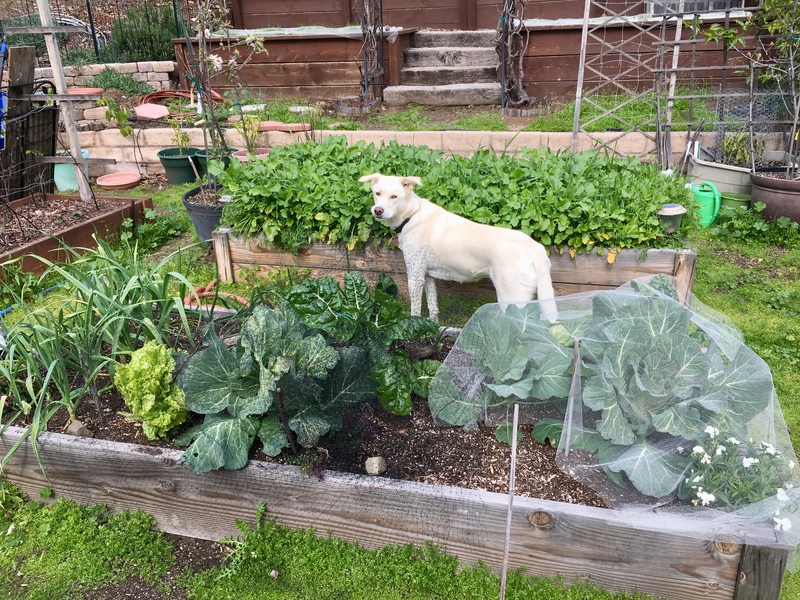 In the picture above, the dog is enjoying eating the cover crop planted in the raised bed for soil enrichment. Other organic gardening techniques for sustainability are rotating crops, interplanting crops, and planting hedgerows, wildflowers, and native plants in the garden area. Kids can encourage the recovery of bat, toad, and bird populations, which can improve pest management and create habitats for these garden partners, providing water in ponds, bird baths, and butterfly puddles. By composting and planting wildflowers and native plants that are home and food for wildlife, kids can help create a balanced ecosystem.